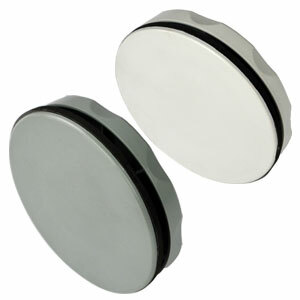 Capable of Sealing Hole Sizes from ½ to 4 ¾"
Designed for Use with Wall Thicknesses from 16 Gauge Through 1⁄4"
The AMHS Series hole plugs are designed to be used in plugging existing unwanted holes in electrical enclosures and come in standard hole sizes for pilot lights, push buttons and conduit fittings. They are available in light grey, RAL 7035, for use in fiberglass enclosures and dark grey, ANSI 61, for metal enclosures. Designed for simple installation in large enclosures can be done by one person. Sized for pilot light, hole diameter .500-.624"
Sized for pilot light, hole diameter .625-.812"
Sized for 1/2" conduit & 22mm PB, hole diameter .812-.937"
Sized for 3/4" conduit & 30mm PB, hole diameter 1.000-1.312"
Sized for 1" conduit, hole diameter 1.375-1.625"
Sized for 1-1/4" conduit , hole diameter 1.687-1.875"
Sized for 1-1/2" conduit , hole diameter 2.000-2.187"
Sized for 2" conduit , hole diameter 2.500-2.75"
Sized for 2-1/2" conduit , hole diameter 2.875-3.125"
Sized for 3" conduit , hole diameter 3.500-3.750"
Sized for 3-1/2" conduit , hole diameter 4.000-4.250"
Sized for 4" conduit , hole diameter 4.500-4.750"